The ability of periodic acid (HIO4) to cleave the C-C bond of vicinal diols and α-hydroxycarbonyl compounds allowed structure determination of sugars and their ketals before spectroscopy was available. Reduction of carbonyl compounds by organometallic or hydride reagents provides a range of schemes for synthesizing various alcohols, where preference may be dictated by the desire to avoid competing processes. Wittig olefination allows conversion of C=O to C=C with good control over constitutional isomerism. Pharmaceutical manufacturers have taken great interest in developing new solvents and reagents that minimize hazards, waste, and environmental impact of traditional reactions. This website may include third-party materials pertaining to relevant topics, provided for the user’s convenience. Yale does not control or take responsibility for the content of any off-site pages or linked sites. Professor J. Michael McBride: So we’ve been talking about oxidation and reduction. And today we’re going to talk about a very special kind of oxidation by iodic acid. Periodate, that is to say. Periodate cleavage of diols. Then we’ll talk a little bit about synthesis of alcohols, about Grignard reactions, about the Wittig reaction, which I think is familiar to most of you, and go on to a little bit of discussion of green chemistry and its relation to the Mitsunobu reaction. And then the next topic is going to be acids and acid derivatives, so we may get to that this morning. OK, just to give you a little view of what’s going to happen during the rest of the year. On Friday we’re going to have the guest lecture that I promised you from Barney Ellison from the University of Colorado. I’m sure you’ll enjoy that. And then the next two lectures will be more about acids, acid derivatives, and what’s called condensation reactions. And then two lectures about carbohydrates, including Fischer’s elegant proof of which stereoisomer was which of the hexoses, and particularly proof of the structure of glucose. That’s one of the… It’s Shakespeare in organic chemistry. It’s something that everybody ought to know. And then finally two terminal lectures which are review actually, but posed in terms of two kinds of syntheses: one of an unnatural product, making cyclobutadiene, which you remember is antiaromatic and therefore unusually unstable; and finally the synthesis of a natural product, cortisone, by Professor R. B. Woodward, who was regarded as probably the best synthetic chemist of the 20th century. OK. So I said we’d talk about diol cleavage by periodic acid. Notice if you show that to anybody else they’ll think its “periodic” acid, but it’s not. It’s “per,” which means heavily oxidized, iodic acid. OK, so it’s the oxidation by HIO4, or some hydrate of it, in an acid solution of a diol, a “vicinal” diol where the OHs are on adjacent carbons. So here’s the structure of periodic acid. Of course the double-bond Os can be hydrated, so you can have OH, OH in place of a double-bond O, but this is a simple form of writing it. And the way I’ve drawn it there, what reaction does it suggest? Suppose, instead of an iodine, you had a carbon there, suppose it were a carbonyl. Anybody got a reaction. Derek, you got an idea? Student: Is it like ozonolysis? Professor J. Michael McBride: I see how you can think it might be like ozonolysis. If we turned it a little bit so you’d have oxygen, oxygen, iodine in the middle, you could imagine a cyclic mechanism a little bit like ozonolysis. But it’s a much simpler reaction I’m talking about of a carbonyl with a diol… just a regular old carbonyl group with a diol. Carbonyl with an alcohol, then. Let’s try that. Carbonyl with two alcohol molecules. Professor J. Michael McBride: Don’t think about the chromium. Just for the terms of the analog, suppose that was a carbonyl group. Instead of I=O, suppose it was C=O. What reaction do you get? Professor J. Michael McBride: Not esterification.. You could imagine esterification of an acid with an ester [correction: alcohol]. But I said not… Suppose it’s not a– suppose it were a carbonyl group, C=O. No OH on the group up at top. What reaction do you get between a ketone– yeah, Matt? Professor J. Michael McBride: A ketal, right? So you get a reaction that’s just like that. A ketal forms. And now we have a thing that’s a little bit like ozone, because this sort of ketal can unzip. That’s what reminds you a little bit of ozone, that kind of thing. So it can come apart that way. And notice what’s happened is that the diol has become two carbonyls, and of course that’s an oxidation. The iodine started in oxidation state +7, right, seven bonds to oxygen, and it ended in +5. So the iodine is reduced, and at the same time, the carbon is oxidized. It’s +1 here and it’s +2 over here. And two of them get oxidized. Two carbons get oxidized. Now, this might remind you of this reaction, where you get two carbonyls. And what reaction is that? What reagent will do that? Professor J. Michael McBride: That’s ozone, right? What reagent does it? Ozone. So it’s nice to think about, when you have a certain functional group you want to get, what reaction will lead to it. So there’s one that will lead to that. We could also think, what reaction would come back from two ketones to give a diol with a carbon-carbon bond in between? That’s a more exotic reaction. Does anybody remember that one? That’s the pinacol reduction that we talked about, where metals give electrons to the ketones, the radicals couple, and then you have two O-s that get hydrogens on them. So that’s the pinocol reduction that we mentioned. And then you might wonder if there’s a reaction that does that, right? And we’ll see an indirect version of that later in this lecture. That involves the Wittig reaction, which is familiar to you from lab. So periodic acid cleavage of carbohydrates, is a diagnostic tool. This is a useful reaction. It’s actually used to prepare compounds. But it also was historically important in finding out the ring size of sugars that we talked about earlier as a problem. Remember, nowadays you do that kind of thing by NMR, but in the early days, you had to do chemical transformations to known compounds in order to figure out what something was. So if you have a diol, as we just showed, you could react it with periodic acid and get two aldehydes. In particular for this one, formaldehyde. So remember what sugars are, are a bunch of carbons in a row. They’re carbohydrates. So it’s carbon-hydrate, OH, H, and then the carbons link together, and one end is CH2OH, typically, and the other end is an aldehyde. Or the carbonyl could be other positions down the chain. But how do you figure out what they are? Suppose you had three in a row and did periodic acid. OK, so you react with one of them, and get the formaldehyde out from the end. But from the bottom part there, you get another aldehyde and OH. And that reacts again with periodic acid. Now, why? Because remember, the aldehydes form hydrates, so they’re equivalent in water to alcohols. So now we have a diol again, and periodic acid oxidizes and cleaves such diols. So from this reaction, then, you get two formaldehyde molecules. And the one in the middle, which had only one hydrogen on the carbon, gives formic acid, So formaldehyde arises from the primary alcohols at the end of the chain, and formic acid from the ones in the middle of the chain, that have just an H on them. And incidentally, I’ve taken these slides from lectures given in the course last year by Professor Ziegler, because he had nicely animated them already. So here’s that reaction we just talked about. Now, suppose we had an aldehyde at the end of the chain and we did this. Now the one… not only the one in the middle of the chain has only one H on it, but the one at the top has only one H.
So from that one, you’d get a formaldehyde and two formic acids, right? Or if the carbonyl were in the middle of the chain, you’re going to get formaldehyde and the acid in the middle. But that acid in the middle itself can hydrate and be oxidized and give CO2. So from this one, we get two aldehydes, two formaldehydes, and a CO2 molecule. So now we could go down and see what groups where that R includes an adjacent H, right, and what products you’d get from them. Formaldehyde, formic acid, and carbon dioxide. So that just summarizes what we just looked at. Now suppose you had glucose. Now, the top would give formic acid, the next one would be formic acid, formic acid, formic acid, formic acid. The bottom would be formaldehyde, because there were two Hs on it. If you had mannitol, a reduced form related to glucose, then the top would be formaldehyde, two Hs, then acid, acid, acid, acid, and at the bottom would be formaldehyde. So you see, the ratio of these various well-known products you get out tell you something about what the structure of the sugar was. Or if you had fructose, which has a ketone in it, you get formaldehyde from the top, CO2 now from the one that has no hydrogens at all. Acid, acid, acid, formaldehyde. And you can also apply it to the question of the ketals that are formed when you form a ring. So remember, we spoke before about this ketal being a protecting group. Both for the aldehyde that was formerly here– and that’s its oxygen– and for the alcohol that was here. OK? Now, we talked about the problem with determining the ring size. Think what would happen with this with HIO4. So it would cleave those two bonds where there are adjacent OHs. Right? Vicinal. Those are the only places where there are adjacent OHs. So it would give formic acid– there was one H on that central carbon– and aldehydes on the end. And now if you treated that with acid and heat, then you’d open up the ketal, right? Ketals could be opened by acid. Incidentally, people don’t typically notice the necessity for heat in this, but it must require heat. Because if you can get that product, which hasn’t opened the ketal in the first reaction, which is done at room temperature for a day.. periodic acid is a strong acid. So here’s water– and it’s done in water. So it’s water with an acid catalyst. You’d think it would take the ketal apart. But in fact taking the ketal apart requires some heat. So that’s done in the second step. And then you get the aldehyde taken apart. So the pieces you get are– from the piece up here, you get OH, OH, and aldehyde. So you get D-glyceraldehyde. From the piece over here you get aldehyde and aldehyde again. And finally, of course, there’s methanol that came along, because it was a ketal involving that alcohol. So by telling what the products are, you can tell what the ring size was. Now, here’s a problem for you to think about. Suppose you could imagine these ketals being formed with other– instead of this OH being the one that’s involved to make a six-membered ring, it could have been this OH and made a five-membered ring. Or in principle, this one that made a four, or that one that made a seven-membered ring. I’d like you to make a table that shows what the products would have been for periodic oxidation of those others to see whether, in fact, you could prove what the ring size was by what products come out from this. This reaction was developed in 1928 and applied for that purpose. That analytical purpose. OK, so that’s oxidation. Now we’re going to talk about a little bit of reduction, and in particular, about synthesizing alcohols and the idea of retrosynthesis a little bit. Which is, you look at the product– usually it’s a product you want to have, and you’re trying to figure out what starting materials and reagents would have given it. So really, you’re working backwards, rather than forwards in a synthesis. So analyzing such problems is called retrosynthesis, and we’ll engage in a little bit of this here, using a problem that occurs in the Jones textbook. OK. So here’s an alcohol we want to get. We want to put R on an alcohol that already has two methyls. Now, we can start with acetone. There are the two methyls. And now we have to put the R on. Now, what kind of R do we need in order to attack a carbonyl? What will attack a carbonyl to make a carbon-carbon bond for R? What form of R will we use? For example, could you use an alkyl halide, RCl? Would that be something that would react in order to give this product? What is it that will react with a carbonyl? What makes a carbonyl reactive? Ruoyi? Student: You need a nucleophile. 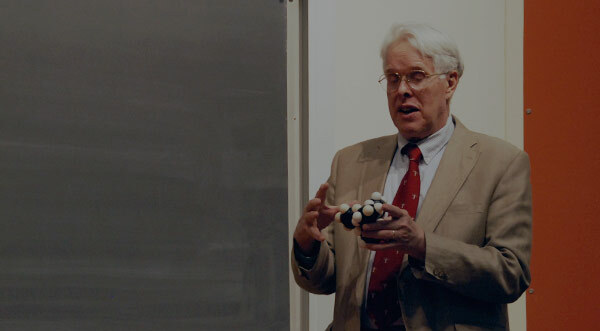 Professor J. Michael McBride: You need a nucleophile. So you need a carbon that has a high HOMO on it. Can you think of any such things? Where do you got a high HOMO on a carbon? Professor J. Michael McBride: From a Grignard reaction, or an alkyl lithium. Something where R is attached to a metal ion, so it’ll be R-. OK. So you have R with a metal, like a Grignard reagent or an alkyl lithium, right? You do this reaction. Then, of course, those electrons could be used to form a bond to the metal, and you get that intermediate. And in fact, as we’ve already discussed, it’s not so obvious what the order of those additions are, the R added to carbon and the metal added to oxygen. It could be either first, or in fact probably both at the same time. So anyhow, we can make that new carbon-carbon bond, and then treat the salt, the O-M+, with H+, and get the alcohol. So there’s a simple synthesis. Now, suppose we wanted to put an H on instead of an R. What form of H do we need? Can we do this with an acid, for example, H+? Is that going to be a good idea? Megan? What type of the reagent, what kind of H, would attack a carbonyl? What makes the carbonyl reactive? Professor J. Michael McBride: Low LUMO. So you need an H with a high HOMO. How about proton? Professor J. Michael McBride: No, protons have no electrons at all. So what form of H do you need? Professor J. Michael McBride: H-. Where are you going to get H-? Where did you get R-? Professor J. Michael McBride: R-Metal. So what do we do now? Professor J. Michael McBride: H-Metal.So this is going to be a hydride reduction, OK? So we have H with a metal, doing exactly the same thing we showed above, except it’s H- instead of R- doing the trick. And we get it from something like H attached to aluminum with a minus charge on the aluminum, which means it’s really going to be a high HOMO. Or H attached to boron with a minus charge on it. So those reagents are lithium aluminum hydride, sodium borohydride, which can reduce an alcohol to put the H on there. And we also talked about the biological equivalent of these hydride donors, which is NADH, where the unshared pair on the nitrogen can get into the, act forming an aromatic system and losing H-, which can go onto the carbonyl group. So we have R- or H- as ways to attack carbonyl groups. Now let’s look a little bit at the synthetic versatility of Grignard reagents. So here’s a problem: to suggest high-yield syntheses where the carbons come only from alcohols with no more than three carbons, but you can use any other reagent. Now, these are very artificial. These are not a problem you’d be faced with in the laboratory, because many of these you could buy. Not all of them, but many of them you could buy cheaper than you could make them. Right? But in a way of thinking about how you do syntheses in an elementary way, this is a good exercise. And as I mentioned here, you can find that problem in the Jones textbook. So let’s think first about the first molecule in this list. Now, what problem do we face in making this from alcohols with no more than three carbons? There are four carbons in it. So we’ve got to make a carbon-carbon bond somehow. So let’s think about what carbon-carbon bonds we might make. We could make the first carbon-carbon bond, nearest the OH, or the next one, or the next one. There are three that we could make. And let’s see how we would go about that. First let’s try to make the one adjacent to the H. So we need to have two carbons that will react with one another, one a high HOMO the other the low LUMO, that will establish that bond. So we need a nucleophile, a high HOMO, and an electrophile, the low LUMO. So what will the nucleophile be? Anybody got an idea? It could be either the piece on the left or the piece on the right. If the electrophile were the piece on the left, the three carbon, what kind of molecule would you do use? If it were three carbons, and you wanted it to be attacked by a high HOMO? Professor J. Michael McBride: A halide would do it, right? The σ* of an alkyl halide would do that. Now suppose you wanted it to be the high HOMO. Then what would you do? Megan, you just told us about that. Suppose you wanted R to be a high HOMO. Professor J. Michael McBride: You’d use a metal, an alkyl metal. OK.
Now, how about the electrophile on the right? Here’s a great example of use-the-low-LUMO-of-carbonyl. So now what we want on the left is the high HOMO. We want the alkyl metal. But we can only start from alcohols. In fact, we can’t even start with this, because that’s a carbon that goes into the product. We have to start from an alcohol. So how are we going to make that from an alcohol? How is it related to an alcohol? We have a H on the carbon, H on here. That would be an alcohol methanol. What kind of reagent do we need to get from the alcohol to this? Is it an oxidation? Is it a reduction? Is it neither? Professor J. Michael McBride: We have to remove two hydrogens. It’s an oxidation. There’s a problem, though. Because the oxidizing agents that oxidize alcohols also react with aldehydes. If you have any water there, water will add, make the aldehyde into a diol, and then that will react. That will get oxidized by the reagent. How do you avoid that? We talked about this last time. You don’t have any water there, right? So we talked about that last time. Pyridinium chlorochromate, done in methylene chloride solvent, so there’s no water there, you can do that trick. So we have the electrophile. Now we need the nucleophile. We need a C3 group with a metal on it. But we can only start with an alcohol. So if we had normal propyl Grignard reagent, that would do the trick. Where do you get a Grignard reagent from? RMgBr. What’s the starting material? So you guys need to go through this to get a little drill under your belts. You get Grignard reagents from alkyl halides. So we could get RMgBr from magnesium and alkyl bromide. But where do we get the alkyl bromide? The rules of the game has us starting with alcohol. Yeah, Amy? Student: You can start with PBr3. Professor J. Michael McBride: PBr3 on the alcohol. So we got it. OK. So we could make that first one. Now how about the second one? Now we need an electrophile and a nucleophile. The electrophile, now on the left, could be the ethylmagnesium bromide, just two carbons. And we would make it the same way here, starting with ethanol instead of propanol. So that one’s OK.
Now, what will the group on the right be? We want to be able to attack this carbon and end up with OH on the adjacent carbon. Now, you haven’t done a lot of problems like this, but you need to think them through and whatever textbook you’re using, you’ll find problems of this sort. So try some of them. But we talked about such a reaction, which is an epoxide. Remember? The strained rings could be attacked by a nucleophile to open here to form this ring, where you attack this carbon and the O comes away as the leaving group, protonated. Now, where do we get that from? Where does an epoxide come from? We have to start with an alcohol. Any reactions that give epoxides? They come by adding oxygen to an alkene. Anybody remember the reagent that’ll add an oxygen? Professor J. Michael McBride: What? Say it again? Professor J. Michael McBride: No. The osmium tetroxide takes an alkene and puts two Os on it. That’ll put two Os. We want to just put one O in the middle. And you’ll kick yourself when– oh yeah, Chris? Student: HOCl, I think you do it with something else. Professor J. Michael McBride: You can add Cl and OH and then remove HCl. That was one way of doing it. There’s another way where you do it in one step. Professor J. Michael McBride: mCPBA, meta-chloroperbenzoic acid. Remember that cyclic, butterfly mechanism that transferred the oxygen from the peroxy acid? OK, so we got that. But now we need the alkene, but we only have available alcohols. But that’s a trivial one. Just dehydrate an alcohol, or dehydrate [correction: eliminate from] an alkyl bromide. So you treat with strong base, and remove HBr, and you got the thing. OK. So we’ve got that. We can do that one with heat and NaOH. Now, how about the bottom one? That one is quite a problem. The problem is that you could have methyl Grignard, but what are you going to attack? Because if you had a four-membered ring here with oxygen, it wouldn’t open. It’s not strained like the three-membered ring would be. And if you try to make the nucleophile be on the left, that top right carbon being an anion, and this one being, say, formaldehyde, then you have the problem that you’d get an OH here. And that’s a problem, because you have to get rid of just one of the two OHs. Or you would have to have a Grignard reagent, or something like here, and that would react with its own H.
Now, you could imagine complicated schemes where you use protecting groups, and stuff like that. So it’s conceivable, but it’s hard work. because this is not a particularly good carbon to be reactive. So it’s not in an activated position. This one was in a position where it could have been attached to that oxygen. This one was in a position that was a carbonyl. But this one has no special virtues that make it reactive, so that one is the tough one to make. OK. Now let’s think about the second one. Let’s try to make that bond, for example, right? Now we need a nucleophile and an electrophile. Does anybody have an idea what the low LUMO is that could be attacked in order to make that red bond? Yigit, you have an idea? We want to make this carbon-carbon bond, and one of the two carbons has to be a high HOMO and the other an unusually low LUMO. And notice, incidentally, that this one that needs to be one of them has an oxygen next door. Student: Yeah, that’s carbon double bond with O; π*. Professor J. Michael McBride: Carbon double bond with O, right? So then what would you use on the right? Student: You need a nucleophile, so RCl. Professor J. Michael McBride: RCl is like R+, right? You want R-. You want a high HOMO, not the low LUMO. Not σ*. And what would you use? Professor J. Michael McBride: It’s a metal, right. OK. So we need a nucleophile and an electrophile. We use the three carbons on the right as a Grignard reagent. And now we need that aldehyde, right? That four-carbon aldehyde. We can only start with three-carbon things, so we can’t oxidize one of the things they give us, and make that aldehyde. How are we going to make that four-carbon aldehyde? Any ideas? You don’t have to look far. Linda do you have an idea? You need four carbons that terminate in oxygen, double bond O. And you can only start with three carbons. Can you think of any way of making four carbons when you start with three or less? That was the first problem, right? So you’ve already made this. Can you think of any way of making the aldehyde? How do you go from the alcohol to the aldehyde? What do you need to do? You need to remove two Hs. Right? It’s an oxidation reaction. So think only of oxidizing agents. Can you think of any oxidizing agent that the changes an alcohol to an aldehyde? Professor J. Michael McBride: Sebastian? Professor J. Michael McBride: Br2 can do it. But you’re going to have problems, depending on how you do it, of over-oxidation. The aldehydes can go on to acids. Professor J. Michael McBride: PCC, the same one we used on the last slide. So you treat that one with PCC in the methylene chloride solvent. You got that aldehyde. So we’ve solved the second one. PCC and methylene chloride. Now, the next one that they suggest you try to make is this one. Suppose you wanted to make that bond. Can you think of any way of doing it? Ellen? What’s going to be the nucleophile? Professor J. Michael McBride: Yeah. What’s the R going to be? Is it on the right or the left, the one we’re going to– that’s going to be the R-Metal that we’re going to deal with? Is it going to be this carbon or this carbon? The bottom-right or the top-left carbon? What’s the top-left carbon going to be in order to make that bond? Amy? Student: It’ll be another C=O. Professor J. Michael McBride: C=O. When we see the O next to the carbon, we think aldehyde. That’s going to be the LUMO that gets attacked. And the HOMO? Ellen? Student: The one on the right. Professor J. Michael McBride: The one on the right is going to be a Grignard. But this time, instead of n-propyl, it’s isopropyl. And this is the aldehyde we need. Any way of getting that aldehyde Ellen? Student: Yeah, it’s the same one. It’s the same one above. So we got that one. OK. Now how about this one? Any ideas for that? So let’s make that bond. So what gets attacked on the left? Amy you want to help us again? Student: Well, it would be… isn’t it the top… or the second one? Professor J. Michael McBride: How many carbons on the left? One, two, three, four, five, six, seven. We can only start with three-carbon alcohols. Student: Could you make the second product and then there’s some kind of shift? Professor J. Michael McBride: Ah. But the second product has the seven with an alcohol in the middle. So what do you do? You need a ketone in the middle. You’ve made the alcohol. You need the ketone. So you have to oxidize it. So you could use the same reagent again, but you don’t need to worry, because it’s a ketone this time, so you’re not so worried about over-oxidation, so you could use one of those chromate things that we talked about, or bromine, or anything. And on the right, it’s just the n-propyl again. We’ve already made that. OK. So we got that one made. What about if we wanted to make the next bond, the vertical bond, instead? Oh. I didn’t show it here. What if we needed to make the vertical bond? It’s the same thing. Right? The thing is symmetrical. It has three propyl groups on there. OK. So here’s another one. How are we going to make this one? Well, we could make that bond. Anybody see how to do that? Mary? What are we going to use on the right? Student: We’re going to use the same reagents. Professor J. Michael McBride: The same one as here, isopropyl. OK. And what’s on the left? Professor J. Michael McBride: that seven-carbon. So we’ve got that one. And now finally, how about if we wanted to make that one instead? Then what would the Grignard reagent be? It would be n-propyl instead of isopropyl. And what would the ketone be? It would be this. And where would we get that? By oxidizing this one. And finally this one. Now, we could imagine making this bond, or making this bond, or making this bond. And we have the means to do all these things now. But one wonders, is there a preferred order? Is one way of doing this better than the others? And in this case, I suspect that they’re all about the same. It might come down to what’s cheap and available and so on, which alcohols are cheaper. And in fact, of course, you would never do this, because simple things like this, you wouldn’t start from the alcohol, you’d buy the bromide or something like that. But when you talk about versatility of Grignard reagents, there are other things they can do, too. For example, if you try to make the diisopropyl methyl version of the carbinol here to make this one, you find that you can first make the salt, then treat it with acid, you get that alcohol, and it’s 95% yield. Great. Now, suppose you want to use t-butyl instead of methyl. Right? So you want to get that one. So you try that reaction, and you get 0% yield of that. The product is this. So what was it that added to the carbonyl? It wasn’t the t-butyl anion. What anion was it? What did the addition? It was hydride. But where did the hydride come from? So it was a reduction by H-, or the equivalent of H-. What you had was the t-butyl Grignard. Now, what problem did t-butyl Grignard have in trying to form this alcohol? Yeah, Cassie? Professor J. Michael McBride: It’s sterically hindered. The carbon can’t get close to the carbon. But a hydrogen can get close to the carbon. That β hydrogen can get close to the carbon. So now we can do this. And you see that the carbon part that was t-butyl loses magnesium and loses H to become the alkene, and the other product, then, is that 65% yield alcohol. And this reminds you, this hydrogen transfer from t-butyl, although it’s happening here in the context of an anion, it reminds you of two t-butyl radicals having trouble forming a carbon-carbon bond and transferring a hydrogen atom instead for the same reason, to avoid steric hindrance. OK. Now, if you use t-butyl-CH2 magnesium bromide, then you don’t have to worry about this hydride transfer. Because it has CH2 in this position, and three methyls attached to that carbon. There is no hydrogen in the β position, so it looks like we’re home free, here. But you only get a 4% yield of the Grignard, right? Because it’s still sterically hindered. What you get instead is protonation of the neopentyl group. So remember that the ketone itself has α hydrogens. So you can form enolates, you can give up a proton from those. So this thing which is a nuclophile is also a strong base, and can take that off, and you get that one plus the enolate, which lost the proton. But then when you work it up with acid, you protonate it again, so the ketone gets recovered, 90% of it, and your carefully made Grignard reagent just becomes the hydrocarbon. No use there. OK. So those are other things that can happen with Grignard reagents. And that same thing, incidentally, can happen here, because the α hydrogen was present here, and this one was a strong base, and in fact 35% of that one was that plus the starting ketone after you put the proton back on. Now, if you try to make this bond, you could make it with– notice the difference this time is that it’s isopropyl instead of t-butyl group here. So you could try doing this. So that has an H β and steric hindrance, so there’s the risk that it would give reduction. But if you started with that ketone and added methyl Grignard, then the methyl doesn’t have any hydrogen β that it could give in reduction, so now you get a good yield of the product that you wanted. So sometimes it’s helpful to choose one of the bonds to make. So in trying to make this alcohol, the thing you get when you protonate here, you could make this bond or this bond or this bond. But the bonds to methyl are much more practical to make than the bond to the CH2 because of the risk of reduction. OK. Now, the Wittig reaction we can zoom through, because you all know that from lab. I don’t remember what base you used to make the Wittig reagent. Do you remember? Professor J. Michael McBride: Sodium what? Professor J. Michael McBride: Hydroxide. So you didn’t have such a simple Wittig reagent as this one. Notice that here you make the reagent by reacting with bromide, just like nitrogen would do– an SN2 reaction. Now you have that cation, and you treat it, in this case, with a very strong base. Butyl lithium. So a carbon anion. What’s the pH [correction: pKa] of a carbon-hydrogen bond, typically? Just like butane losing a proton? Professor J. Michael McBride: Order of 50, right? Very weak acid. So the butyl lithium is a very strong base, and pulls that proton off the CH2. Now in this case, the pKa is about 30 of the CH3 group to lose a proton. You’re never going to get that off with hydroxide. But you can do it in this case with a stronger base. But what is it that… you couldn’t do this if, instead of phosphorus, you had nitrogen. Now, what’s good about forming this anion? Why is that anion a reasonable one to try to make, where you don’t pull hydrogens off carbons willy-nilly, not off normal hydrocarbons? What does the neighboring phosphorus have to do with it? How does it make it easy to form the anion? Well, the phosphorus is a cation. It’s easy to form an anion near the cation. You could do that with nitrogen. It could have been N+, the next neighbor up in the periodic table, right? But phosphorus is even better. Because when you get that anion to be stabilized, phosophorus, down in the next row of the periodic table, has vacant d-orbitals that are able to stabilize that electron. So it’s especially acidic, but not so acidit that you’re going to pull it off with OH-. So you could draw a resonance structure where you have a double bond, where not only the phosphorus has given electrons to the carbon in making the bond, but the carbon has given electrons back to the phosphorus through this d-orbital interaction. Anyhow, you have this the so-called ylide, and then it can act as a nucleophile with a carbonyl, and now the oxygen can add to the phosphorus, which can form five bonds, because it has extra valence orbitals, these d-orbitals. So you get the four-membered ring. But that very easily unzips because the PO double bond is unusually stable. The NO bond of a trivalent nitrogen that then adds oxygen, is only seventy kilocalories per mole, but the phosphorus version is 100 kilocalories per mole, because of those d-orbitals making it especially stable. OK. So you can get that triphenylphosphene oxide and the alkene, and as you know, what the Wittig reaction results in is replacing double bond O by double bond CH2, or in other cases, double bond C something else, depending on what you started with up here. And I say directly– because there are other ways of going roundabout to do this, rather than to do it directly. For example, you could add a methyl Grignard to this ketone to make the alcohol. Treat that with acid, lose the water to make the primary cation, and it could then lose a proton. And that would replace– here’s what our CH2 is coming from, right? And then we lose the H from the CH3 to get that. So that replaces the double bond O with double bond CH2. The same thing the Wittig reaction would do, except that’s not the major product. It’s a minor product. What’s the other product? The other product is losing a different α hydrogen. One of those. That’s the major product. Why? It’s a more stable alkene, more highly substituted. So you can see the advantage of the Wittig reaction, which directly gives the replacement of double bond O by double bond CH2, in this case, or double bond CHR, or double bond CR2. Now, I was going to say a little bit about green chemistry in connection with some of these reactions we’re talking about. So pharmaceuticals are a big chemical industry nowadays. A hundred years ago, it would still have been dye industry. And then petroleum, pharmaceuticals, plastics. But now, pharmaceuticals generate only 0.2% of the chemical industry’s product, measured by mass, but 25% of its value in money. Which means that it’s worth doing a lot of work on those, to do a lot of reactions, in order to get these pharmaceuticals. There’s a lot of value added. But in the process of doing all these manipulations, the pharmaceutical industry generates more than 50% of the chemical waste. So the idea of green chemistry is to find new ways of doing things that won’t generate so much waste, or will be safer, for example. So there’s a journal called Green Chemistry, and in 2000, they published a paper called “Key Green Chemistry Research Areas: A Perspective from Pharmaceutical Manufacturers.” So representatives of the biggest pharmaceutical companies, AstraZeneca, GlaxoSmithKline, Lilly, Pfizer, Merck, Schering-Plough, which is now part of Merck, got together to talk about what they saw as the places where you could make advances to make chemistry more friendly to the environment and to the people practicing it. And obviously from the perspective of the pharmaceutical industry. So this is gazing in a crystal ball, and there’s nothing as hard to predict as the future. But at least these are their ideas, and they’re people that have a great practical interest in it, not only in the sense of there are things they want to happen, but they’re willing to give money to people to try to help make it happen, to do research projects, to try to develop new ways of doing it. So they were trying to decide what they would most like to have. So it involves frequency of use. If there’s a reaction you hardly ever use, you don’t want to spend a lot of trouble on that one. But if there’s something that you use all the time that you could make better, then that’s important. So frequency of use. How much volume is involved of the stuff. If it’s only a milligram, who cares? But if it’s tons, that’s a big deal. And of course, safety is another one. So one of the top priorities is solvents, because that’s what they use the most of. And something that wouldn’t occur to the outsider, probably, is a very important thing is to clean the– they have these big reaction vessels and they have to clean them so that stuff that’s left over from the previous reaction doesn’t get into some other drug. So they have to be scrupulously cleaned. And two thirds of the solvent they use is used in cleaning the reactors to make sure that they’re clean. But there might be other ways of doing it. For example, use water and an oxidizing agent like hydrogen peroxide maybe to do it. So anyhow, they’re interested in that as one of the big steps they could take. Or replacements for what are called aprotic solvents. So these are organic solvents. They’ll dissolve organic compounds. But they also typically dissolve salts. So you can have salts react with organic compounds in these solvents. So ones like NMP there on the left, N-Methylpyrrolidone, or dimethylacetamide, or dimethylformamide are very heavily used solvents, because you can mix organic and salt reagents in them. But the problem is that they’re very difficult – because they’re miscible with water, they’re very hard to get out of the water at the end of the day. They’re worried about polluting water streams. So they would like to get replacements for that. Now, you could wish for anything. You could wish for $2 billion. I’d like to have $2 billion now; I’m willing to split it with all of you guys. That doesn’t mean it’s going to happen. And so you can see a real problem with this. The reason these solvents are good is because they’re organic and they’re miscible with water. But the miscibility with water is what makes them bad, because it’s hard to get out of the water again. So I don’t know what progress has been made on this. But anyhow, it’s something that they would really like. But then they thought of thirteen processes, that is, not just solvents but actual reactions that need improving. And the ones that they already use heavily. And fourteen, they suggested new processes that there isn’t a good way to do now, but would really be handy if you could do them. And then they voted. So there were six companies represented doing the voting, and each of them could cast five votes to choose among the thirteen processes that need improving, and another five votes among the fourteen processes that they would like to have available. So this is the perspective from the people who really do it about what would be useful to do. So current processes that need reviewing. All six of them voted that a way of forming amides, avoiding poor atom-economy reagents. Now, what that means is you’re just trying to put this nitrogen onto a carboxylic acid to make an amide. But if you use other reagents that have an enormous number of atoms in it, then necessarily, you’re going to have an enormous amount of waste generated. But if you could do it with atom-economy, so you have a minimum number of atoms going in, in order to– ideally would be just the element you want to have added to the molecule, right? For example, a catalyst might allow you to do that, where a stoichiometric reagent, where you have to add a whole mole of it, wouldn’t do it. So then, OH activation for nucleophilic substitution. This is something we’ve talked about a lot. You make the OH, you protonate it, you make it into an acid chloride, you make it into a tosylate with the leaving group. But this is something that five of these industries still say is one of the most important things to develop. A better way of activating OH for nucleus [correction: nucleophilic] substitution. Reduction of amides, the carbonyl group in amides, without using hydrides. So they say, lithium aluminum hydride, having a molecular weight of 38 and four hydrides per molecule, has the highest hydride density. So from the terms of atom-economy, it’s very good. But it co-generates an inorganic byproduct which is difficult to separate from the product, and that makes the filtration slow, you lose product when you’re trying to filter it, get absorbed in this extra junk that’s being made. So they need something better than the available hydride reagents. Or to be able to do oxidation or epoxidation without using a chlorinated solvent. Four of them said that was a top priority. And they noticed, in connection with the oxidation, that using the kinds of metals, like chromium or osmium, that we’ve talked about, or manganese, these have virtually been eliminated from pharmaceutical processes, because small amounts of these metals could be injurious to the health. So the FDA requires that there be none in there. So better is to use oxidizing agents that don’t involve such metals when you’re making pharmaceuticals. OK. Then safer and more environmentally friendly Mitsunobu reactions. Now, we’re going to talk about the Mitsunobu reaction next. But three said that was important, so it’s worth knowing what the Mitsunobu reaction is, if they think it’s so important. Friedel-Crafts reactions on unactivated systems. We talked about substituents that were activating or deactivating. But there are not good ways, they say, of doing their Friedel-Crafts reactions on unactivated systems. At least two of them said that. And two of them said nitrations was a problem, not because the reaction’s hard to do, but because of the danger of explosion with nitric acid. Now, how about the new processes they’d like to see? All six of them said aromatic cross-coupling, that is, putting two benzene-type rings together carbon-to-carbon where you only had hydrogens ahead of time, where they come together. Oh, sorry. I’m talking way too long. We’ll do this next time.